A few days ago I experienced a beautiful and blessed day. I thought I’d share a picture and a few words about it with you in this blog post. The day included much – but a river, blades of grass, sunshine and God’s gentle touches all figure prominently. The day was especially appreciated as my experience of God of late has been, well, let’s just say, He’s been seemingly quite remote. And it was after a few weeks of physical and spiritual suffering, that I won’t detail here as we each have our own variety, that these events unfolded. It was a sunny but brisk fall day in rural New Mexico. It was one of those days when each event and encounter seemed especially created for me in love. Even the little meditation spot along the river I stumbled upon seemed to be carefully prepared with clean, fresh and dry hay. Such a place to sit. Just sit. Perhaps it WAS all prepared for me? The God of my understanding is like that, you know. Loving, providential, present. Have you ever had such a day? I sat on the side of the river bank and meditated. Just sitting. Once, on a months long retreat at a Benedictine monastery in Vermont, it became difficult for me to sit and to meditate so I asked a friendly monk brother for help. I asked him what he thinks about when he is meditating. He responded by saying he tried not to think too much and he allowed himself to “just sit.” Sometimes when his mind wandered he would gently say to himself, “Just sitting.” And then he returned his attention to his breathing. I tried that on the side of this river. Just sitting. When I opened my eyes after some time sitting, the nearby blade of grass jutting out into the air seemed to pulsate with the glory of God. It seemed for a moment all the mystery and beauty of nature was captured in that blade of grass. I could have meditated on that blade all afternoon. “Heraclitus would have loved this river,” I thought to myself. He was known to have said, “You can’t step into the same river twice.” This river, flowing strong and always changing, reminded me of the impermanence of life. When I considered the river with it’s flux and turbulence, I was also reminded of something I heard many years ago. God is in the rapids and in the flux as much as He is in the rocks and in the banks. No need to cling to safety and comfort. Let go. God is there. I was captivated by all the beauty surrounding me near this river. The beauty didn’t seem to surround me so much as it penetrated me. It was moving through me. Piercing me. All alone with God. It was a nice moment by the river side. John Muir once wrote, “Walk away quietly in any direction and taste the freedom of the mountaineer. Camp out among the grasses and gentians of glacial meadows, in craggy garden nooks full of nature’s darlings. Climb the mountains and get their good tidings, Nature’s peace will flow into you as sunshine flows into trees. The winds will blow their own freshness into you and the storms their energy, while cares will drop off like autumn leaves. As age comes on, one source of enjoyment after another is closed, but nature’s sources never fail.” Nature’s peace flowing into you as sunshine flows into trees and cares dropping off like autumn leaves. True this, eh? Do you know the Rio Grande was called El Rio de Nuestra Señora before it was called “Big River?” I suspect it had an even more majestic name prior to that. Subsequent to being named El Rio de Nuestra Señora, it was called El Rio Bravo, The May River and even The Turbulent River. 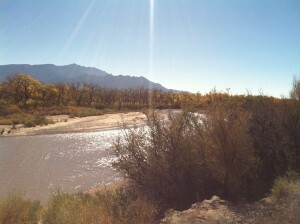 I like the name Our Lady’s River (El Rio de Nuestra Señora) best, how about you? As I carefully made my way up the river bank and back into civilization, a lone photographer walked by. A protective sun hat and a camera with a large lens indicated his pursuit. He said, “Beautiful colors and nice light today ‘eh?” I replied with a warm smile and a definitive, “Yes!” He recognized that my brief response was not an anti-social stance but rather a recognition, in silence, of the true awesomeness of the moment. He returned a smile and, understanding the moment, joined me in contemplating (alone but together) El Rio, the Cottonwood trees and the desert cacti at the base of The Mountains of the Holy Day. May your day today be filled with such an adventure, mystery and beauty. It’s all there. Where is a spot that you find health, healing and a communion with the Divine? Please share by leaving a comment.